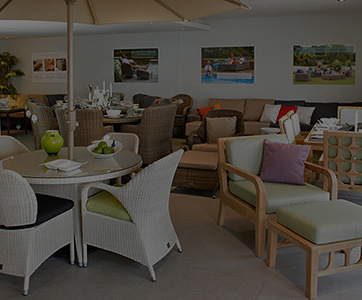 Since we started manufacturing garden furniture in the 1980’s one of the major problems that our customers have been faced with is what to do with their garden cushions during periods of wet weather. Originally this problem was confined to our Teak and Iroko ranges of wooden furniture but with the emergence of new materials the problem became more prevalent. When we introduced rattan outdoor sofas to the UK in 2005 this problem was more apparent than ever. Because carver and recliner cushions are reasonably small they can be stored in a shed or garage with relatively little fuss. However when we introduced ranges such as our Kingston modular sofas (cushion padding depth: 25cm) we realised that a solution had to be found. For 2 years we tested dozens of fabrics, foams and existing garden cushions but none met our requirements. The only waterproof cushions available at the time used quick drying foam which is hard and rather uncomfortable to sit on – this is because the foam is a ‘closed structure’ to prevent water from being trapped inside, causing it to go mouldy. We therefore had to find a way to manufacture waterproof cushions that were both waterproof and comfortable. After countless tests we decided that an acrylic based fabric would be the best solution to our problem. Acrylic fabric is extremely durable and isn’t affected by UV, nor is it easy to mark or tear. 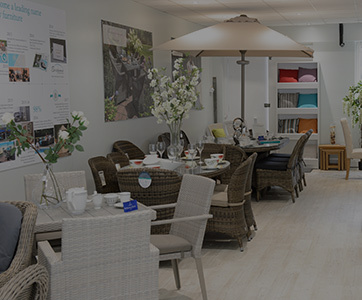 We were already sourcing the finest acrylic fabrics for our garden furniture so we were aware of its beneficial properties over polyester and oil cloth – polyester is not suitable for weatherproof garden furniture and oil cloth (whilst fairly water resistant) is not very breathable, nor comfortable to sit on – especially on a hot day. Once we had decided to use an acrylic fabric we needed to find a suitable way to make it waterproof whilst still allowing it to breathe. Before the fabric was woven we had the yarn soaked in Teflon and sealed – this not only helped repel water but also ensured that the fabric would be highly stain resistant. With the now improved acrylic fabric we back coated the cushions with thick waterproof membrane to prevent any water reaching the cushion foam. This breakthrough enabled us to not use quick drying foam & allowed us to choose the most comfortable fillings available to us. All of this has resulted in waterproof cushions for several ranges of Bridgman rattan furniture. 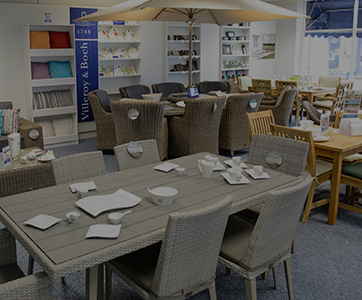 As of this writing, waterproof cushions are available on our Brighton, Kingston, Tilbury and Valentine ranges – and we plan on increasing this offering on more of our rattan ranges. The red wine can be wiped straight off leaving a clean cushion. Or, if the stain dries on the cushion fabric it can be cleaned off with warm water and a sponge. Despite this being a fairly long and expensive process we are now proud to offer the UK’s most comfortable waterproof cushions. 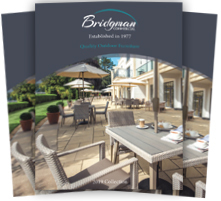 We have carried out extensive testing so that you can enjoy Bridgman weatherproof garden furniture all year round, safe in the knowledge that it will look as good today as it does in 10 years time. 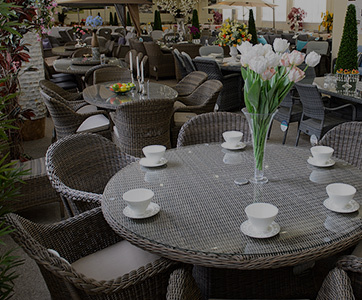 If you are interested in outdoor furniture that will last the test of time, why not take a look at our range of Luxury Garden Furniture. 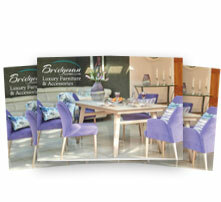 Please note: Bridgman waterproof cushions are exclusive to models of Bridgman furniture. At this time we are unable to make custom cushions for furniture that is not designed by Bridgman. I need outdoor cushions that are waterproof. Hi I was wondering if you make cushions to order. I have some furniture that I need the cushions for? Thank you. Hi Michelle, thanks for getting in touch. I’m afraid we are not able to supply the fabric for the cushions because without proper construction the seams would let water through. It takes a fairly long and expensive process to make the cushions fully waterproof & it took us several years to develop the technique. As a result we don’t want to supply the fabric if our customers cannot achieve their end goal. I want to make covers for our outdoor furniture… mainly to protect stacks of cushions! Is your material suitable for this? This fabric would be suitable, but when making the covers you would need to seal the seams to stop and water from entering through the stitching. To be honest this fabric would be over engineered for cushions bags – it is grade 8 UV stability (the highest rating) which means it is extremely resistant to fading. The teflon in the fabric also means the fabric is stainproof – again, something that isn’t necessary for cushion storage. For making a cushion cover/bag you would probably be better off using a grade 3/4 material as it will be significantly cheaper. Hi I have just purchased a rattan corner sofa set and there was a seat cushion and a small scatter cushion, do you sell just the cushions? 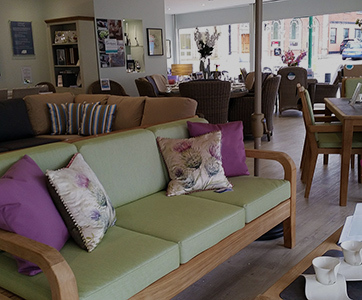 The cushions have been exclusively developed by us and as such they will only fit certain models of Bridgman furniture. At this time I’m afraid we’re unable to offer waterproof cushions for other companies furniture. Great now we can buy the waterproof cushions for the waterproof furniture means totally awesome. Now the furniture and cushions are more protected. Really it is a great news. Hi. A year or so back now we purchased what we thought to be a good quality, all weather corner set etc, but last year when i removed the covers to wash them, the supposed membrane around the foam and wadding inner had crumbled and disintegrated into a total mess. We live in an area with lots of trees and the green pollen from them has stained the covers? Basically it all looks a horrible mess! If we were to purchase a totally new set from yourselves, do you have a guarantee that we can leave them out ALL year come rain, snow, frost and sun and that they will not loose quality etc. We are looking for a no fuss set that we don’t have to bring inside in the winter. Also, that if there is any staining that it can either be washed or wiped without interfering with the quality or weatherproofing? Many thanks in advance. Sorry to hear that you’ve had problems with your furniture from another manufacturer. Our waterproof cushions certainly are fully waterproof and highly stain resistant too. Because there is Teflon baked into the yarn before it is woven into fabric stains are easily cleaned off. Over the winter we would recommend covering the furniture and cushions just to keep them clean whilst not in use, especially if your garden is susceptible to debris from trees. If you would like to email sales[at]bridgman.co.uk for the attention of myself I will assist you in the best way I can. Hi Gary, many thanks for your message. We have 3 different ranges of modular furniture with waterproof cushions. Can you please send an email to sales[at]bridgman.co.uk (marked for my attention) and let me know the dimensions of your cushions. I am looking for an all-weather cushion for the seat of my hardwood bench. The dimensions of the seat are 47 cm x 170 cm. My preference would be for a natural/ oatmeal/ ecru colour. Do you have one which would fit the bill? Hi Andrew, many thanks for your message. Can you please send an email to sales[at]bridgman.co.uk marked for my attention? I have to say I am simply stunned! You seem to have designed and created a true outdoor, water proof cushion / material. This is something I know a thing or two about. Many of the outdoor products on the market today are water resistant but not truly water proof and require covering when not in use – or in heavy rain. As for the dealing with wine stains! Well, what can I say! Just Brilliant. It might have been an expensive and long journey for you, but you seem to have cracked it. I am designing a bespoke seating area at home which will be made of concrete blocks covered in porcelain tiles. I am looking for a substantial cushion and the picture of the ones in which wine is spilt looks perfect. Could you please give me the dimensions of your cushions? Ithe area is 3mx4.2m, and I would make the seating to fit your cushions. Could you also give me an idea of cost for seating and back cushions to fit this area. Hi Aneu, thanks for passing by. Can you please send an email to sales[at]bridgman.co.uk marked for my attention? 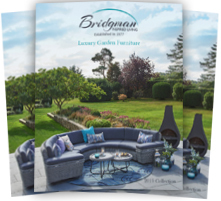 We would like to purchase quite a bit of bridgman outdoor furniture next year for both a new gift and our own use. It would be a combination of wicker line and all seasons for here in France. We already have wicker line, bought a few years ago, and are very pleased with it. We would like to have the wicker line sun loungers, with the back wheels, but would prefer the waterproof cushions. I understand this is currently not an option but I wondered if you have any plans to introduce them. It would be easier for guests if they didn’t need to worry about bringing in cushions at night or when it rains. Hi Lynn, thanks for your comment. I am glad to hear you enjoy your outdoor furniture. Concerning your requirement, could you please you please send an email to sales[at]bridgman.co.uk marked for my attention? Looks like a great outdoor solution. But wondering can rain/water still get into the cushions through the seam lines? If so, does it cause any problem on the inside of the cushions? That’s a good question, Suzanne. Fortunately all of the seams have waterproof tape heat sealed to prevent any water from getting in. Because they’re large cushions they do need the ability to ‘breathe’ i.e. allow air in and out so there is weatherproof textilene venting on the underside of the cushions. It is not unusual for a little moisture to enter through the venting but then there is an additional waterproof membrane to prevent moisture reaching the foam. In the unlikely case that the cushions are submerged in water (i.e. thrown in a swimming pool), the covers are removable and you’ll simply need to allow the foam to dry out before re-using. Hi – I am looking for a rattan two seater sofa (small urban garden) in dark grey with grey cushions and preferably rectangular in shape. One of your styles is similar to what I am looking for but the arms look too chunky for my small space. Do you have anything suitable in your all weather fabric? Hi Sarah. The closest thing I could recommend would be our Grey coloured Oxford sofa. If you like the style of this, pop us a quick call/email and we can discuss what can be done to provide matching cushions. Hi, I have 2 dining sets and 6 lounge chairs in soft white Sussex with lime green cushions, one set in Spain and the other in UK. The Spanish set needs new covers, I don’t want the whole cushion because I want to take the covers in my luggage next visit. Is that a possibility please? Hi Kim, one of our customer services team will be in touch in the morning to discuss how we can best help you. Thanks for taking the time to get in touch and I hope you are getting a lot of use out of both sets!